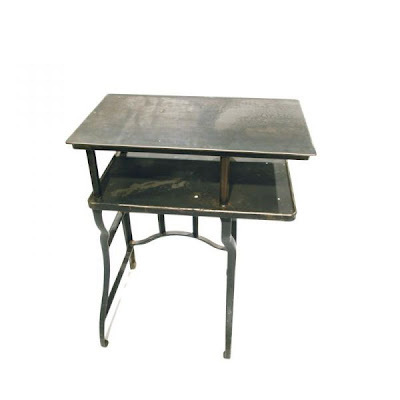 Essentially the well worn stools, tables, office furniture, lighting and other goodies from factories and schools, medical facilities, churches, farms and shops. I love the ingenuity and the re-use of the whole style. Who doesn't love THAT work ethic?! 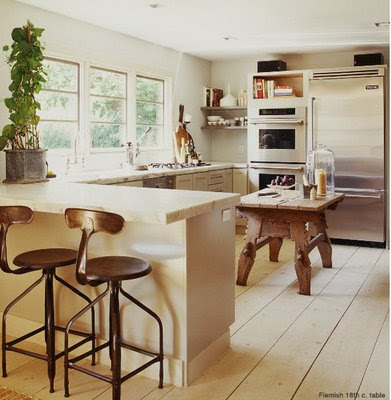 I love the mixing of these vintage pieces within a modern room, like in the kitchen pic. The wood table does not look out of place but seems to be in harmony with the rest of the "modern" look of the kitchen. I also lov those barstools. I do not KNOW what happened to this formatting...the bed image is from marie Clair. Wow! 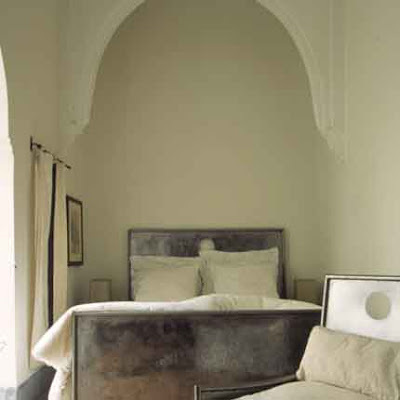 I love that bed and the arch it sits under. Oh! That BED! it is wonderful!!!! I do like this industrial look alot. I almost went for a desk like this. Cool pics as usual-so you do NOT want any any of those books, even though you are the first commenter?? I know it was lame to do this give-away especially when I realized after the fact that you are supposed to pick names from all of your commenters!!! I am so a blogging dummy!! Ok, Linda, I will leave you with your memories of Mary Engelbreit and your grown up kids!! Have a good night! Yahoo... 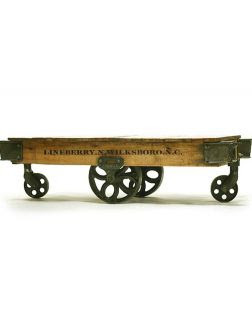 I love the little island in the kitchen, I love the flatbeds on wheels! I want one in our living room! How cool would that be to put a glass top one of them! A number of these vintage style furnishings can be found at Wisteria.com. Teaorwine...Yes, Wisteria HAS been putting some in their catalog...another higher end...but fun to look at place is www.sonrisa.com. Joyce....OVE the little flatbed too! especially the wheels! Katie, Sandra, Donna...The bed and it's surroundings IS gorgeous!! Laura...I think you saw a kitchen that was on there for a bit...with a GREAT table. Then when i tried to fix the formatting,whooosh, it vanished (rolling eyes). Sorry!! 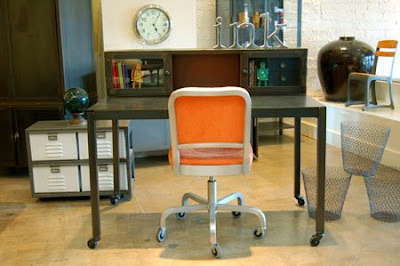 I love industrial style when it comes to furniture - it's probably because I love steel. oh, industrial chic, my hearts desire. i want those kitchen stools! wonderful post, i love it! as for the vacation, had one rainy evening and one cloudy day. other than that, we were blessed with sunshine. so much that we got a little burnt on the last day. Ooooh! So wonderful. I especially love the bed! I agree, ordinary objects that do their job well can unexpectedly turn into decorative elements years later, leaving you to wonder the stories that went on around them. The bedroom is my favorite pic - the bed really looks like a piece of art! Thank you so much for adding my blog to your list!! I agree with the others who love the bedroom - thanks for sharing some design that I normally wouldn't say is my taste. 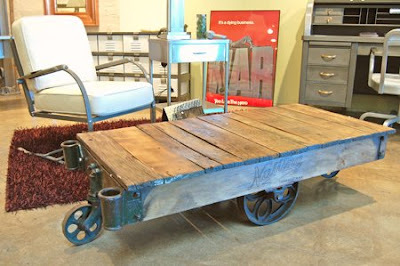 Vintage mixed with industrial is COOL!! WOW I'm crazy about this post!! Wow! found you through Carolina eclectic- so glad I did! looking fwd to scannining the archives too! Love it all, Linda! My best friend owns and animal hospital, and she's been talking about getting rid of the old (vintage!) examination tables. They are TRES chic, and I told her I want dibs when they decide to get rid of them. I have no idea what I'd do w/one. Kitchen Island, maybe? They're stainless. And stylin'. Like YOU! Hee! Makes me crave zinc countertops...or somethin! 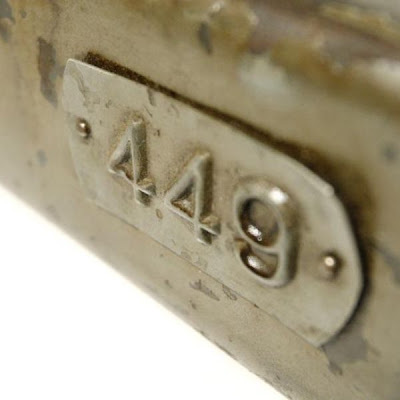 + I love the vintage raw wood and iron funiture, nice find! Oh how I LOVE your blog!!! !